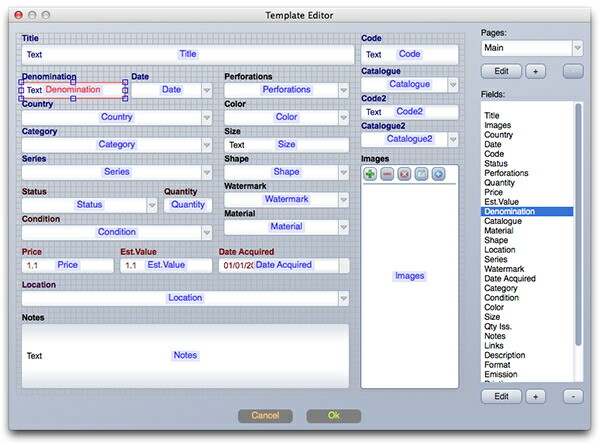 Template Editor is used to create and edit your Database template. Customers can add/delete/edit database pages and fields. Every Database should contain at least one page. 'Images' and 'Title' are required fields. They cannot be erased or moved outside the first page, but they can be renamed, resized and styled. Number - Any number can be used as Currency. The currency format is customizable in the database settings (Tools -> Currency, Date). Integer - The integer number can be used as Currency. The currency format is customizable in the database settings (Tools -> Currency, Date). Date(day, month and year) - The date format is customizable in the database settings (Tools -> Currency, Date). String - One line of text. Text - Text with multiple lines. The text field can contain references to external objects (files and websites). Use drag & drop to add an external reference. 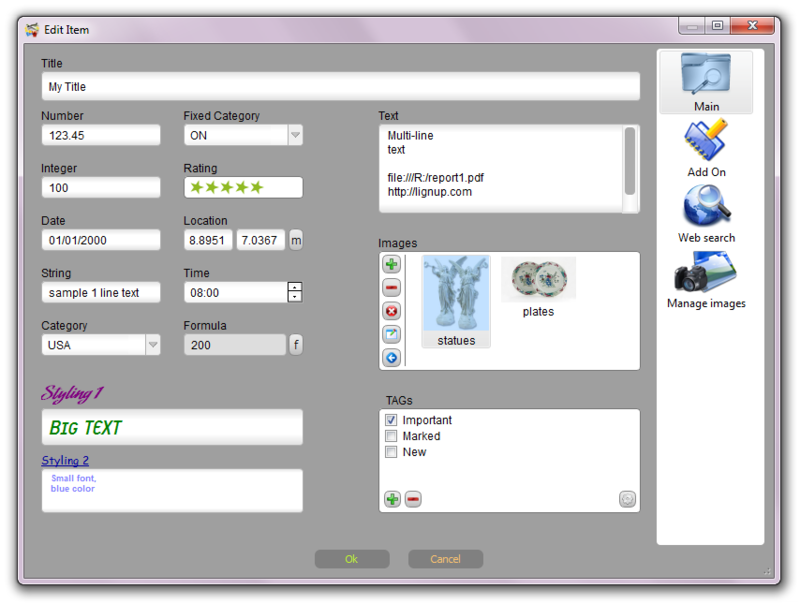 Such objects can be opened by a mouse click in the Details view. Category - Drop-down box with default values. A new value can be added by typing in a text field. Such categories can contain predefined values and entered by user. Fixed Category - Drop-down box with default values. Users can't add additional values in the item editor. TAGs - List of TAGs. User-defined TAGs. Formula - A field with a user-defined formula. The formula field result can be used as Currency. The currency format is customizable in the database settings (Tools -> Currency, Date). Time - Time field HH:MM. Location - World coordinate (Lat/Long). Click on the 'm' button to see coordinates in the google maps. 1. Many images containers can be added to the template, but only the first container with 'images' unique ID is used to generate cards and table thumbnails. 2. Every field should have a unique ID (Latin characters and optional digits). - Add new, edit, delete fields. - Move, resize, and move to another page’s selected fields. - Multiple fields selection. Hold Ctrl(CMD) to switch field selection. Hold Shift to add field to selection. - Change field style. Assign font and color for field label and field data. - Change field type. Multi Collector will try to convert your data between old and new data type. It can convert data between numbers, text/strings, and categories. Be careful, you can lose some data in the converted field in a case of their format not being properly formatted or non-convertible. - Add, Delete, Edit name, Set icon for page. Click on '+' to add new field, or click on 'Edit' to edit existing field. 1. Title - The visible name of the field. It can be edited at any time. 2. ID - The unique ID of the field. Every field should have a unique ID (Latin characters and optional digits). The ID is not visible during database usage, it is used to identify the field in the database. ID is entered at creation time and can't be changed later. 3. Field Name Font and Color - Use Font and Color picker dialogs to setup field name style. 4. Field Value Font and Color - Use Font and Color picker dialogs to setup field value style. 5. Values - predefined values for categories and formulas. This field is optional. Use it to provide a set of values for categories or to enter a default formula. 6. Type of the field (see above). 7. 'is Currency' - Check this if you want to have a currency field (can be used for Integers, Numbers, Formulas). 8. Preview - Apreview of the field. 9. 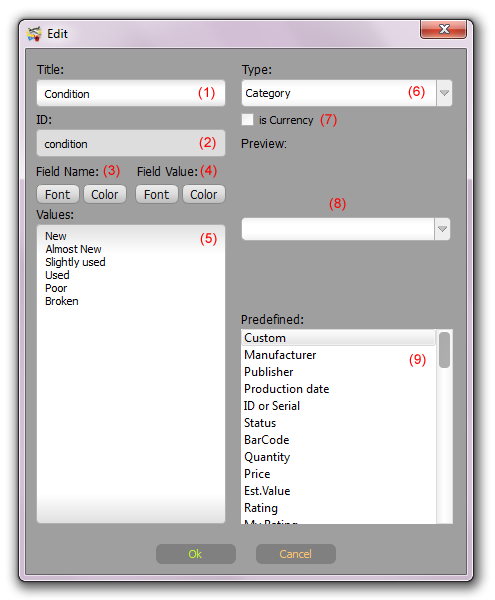 Predefined - The most popular fields. Choose any of the available predefined field. Multi Collector will fill all data (1-7) with the common settings.